In Nicolas Cage‘s long, glorious, and bizarre filmography, Outcast could be more than a minor curiosity. The directorial debut of Nick Powell (stunt coordinator on Resident Evil: Retribution), Outcast takes place during the Crusades, and Cage plays Gallain, a rebellious outlaw who teams up with Arken (Hayden Christensen, who, to my surprise, is still in the acting business), a young man looking for redemption by protecting the rightful heir to the Chinese throne. 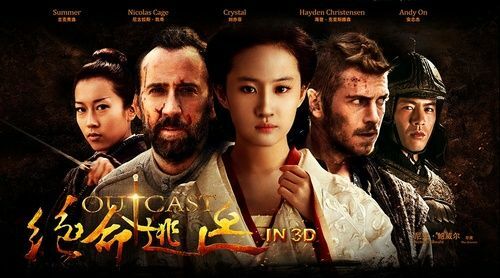 If you needed more proof of China’s growing power in the global film market, look to Outcast. First Cage; tomorrow: THE WORLD. But in the meantime, they only have Cage, or, more specifically, Cage trying to do a British accent, which is about as wonderful as you’d expect. Hit the jump to check out the Outcast trailer. The film will be released on February 27, 2015, and also stars Yifei Liu, Fernando Chien, Andy On, and Byron Lawson.